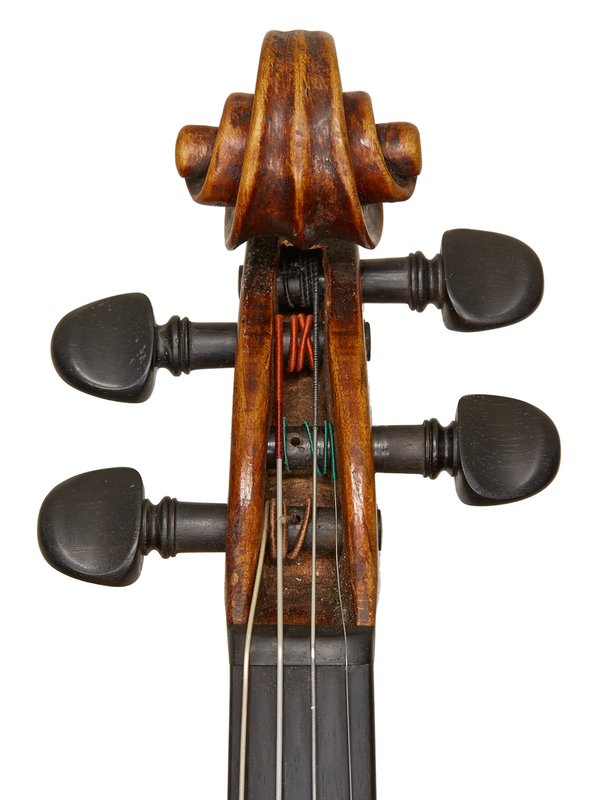 The strong violin making tradition of Naples, initiated by Alessandro Gagliano early in the 18th century, flourished until the second half of the 19th century. At this point the city’s deteriorating economy and the political instability surrounding the Risorgimento (Italian unification) caused a mass exodus of its working class, hoping for a better life in the USA. Curiously, no Neapolitan violin maker of any consequence seems to have boarded the vessels for Ellis Island, suggesting that the profession somehow remained viable in Naples despite the rampant hardships. 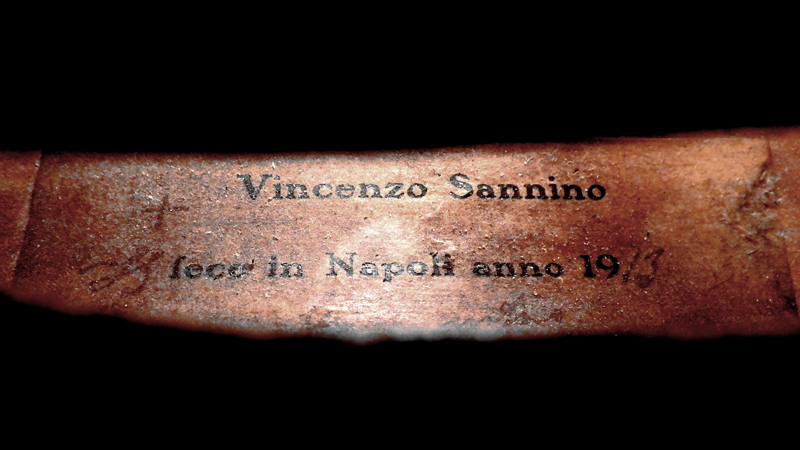 Vincenzo Sannino, born in 1879, turned to violin making when Italian political disturbances had subsided and the country’s instrument making was reviving. He was also the only significant maker from Naples to leave his home territory and, as we shall see, in time he also strayed from the purely Neapolitan style of violin making. 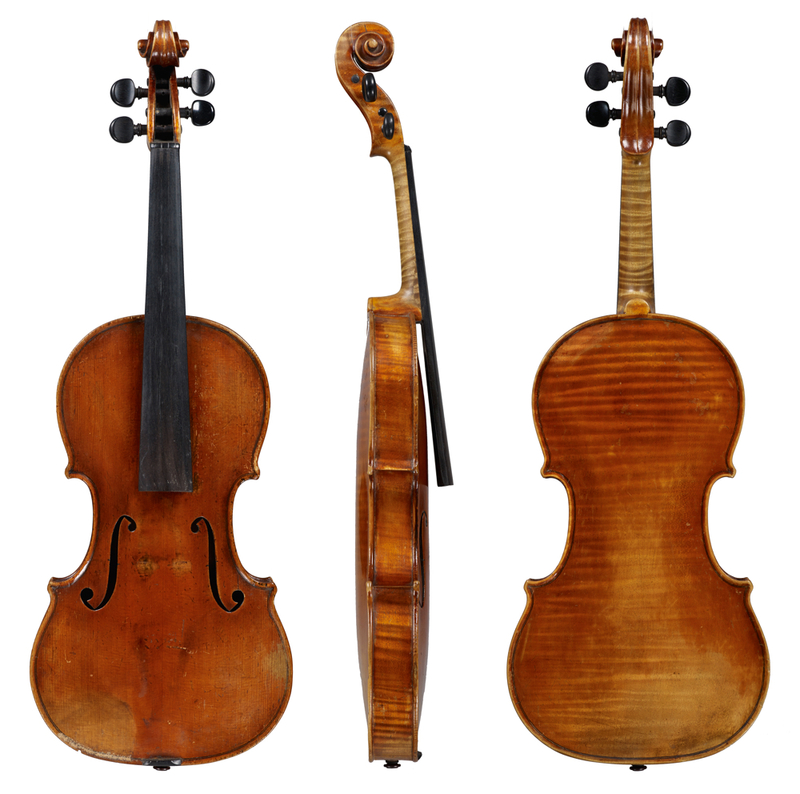 The violin making scene in Naples during the later 19th century was dominated by charming and interesting, but generally stylistically decadent makers such as Vincenzo Iorio (fl. c. 1830–1850) and the more able Alfonso della Corte (c. 1834–1884). 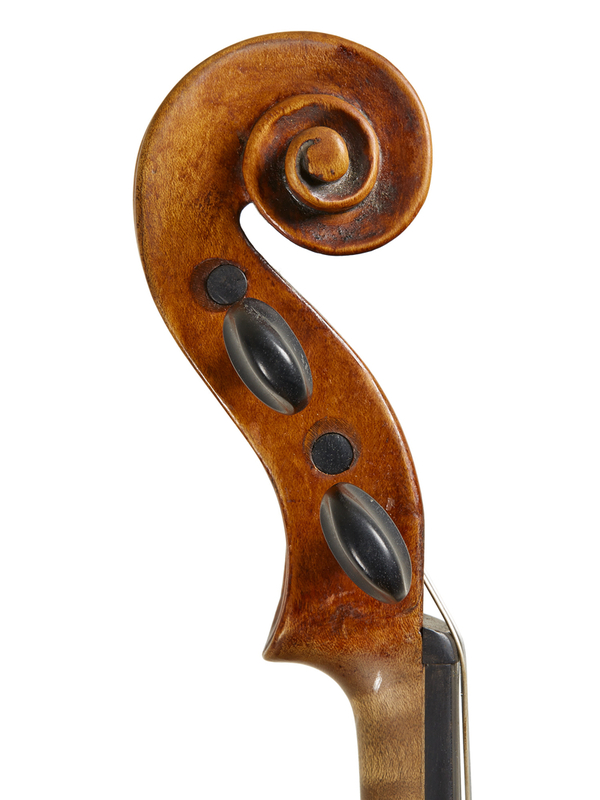 A fair number of other relatively obscure makers, including some vestigial members of the Vinaccia and even Gagliano families, still worked in Naples during the later 19th century, but none of them managed to achieve the unified style for which earlier Neapolitan violin making had been famous. Most remained obscure until that talented and prolific craftsman Vincenzo Postiglione began making fine instruments around the mid-1860s, followed in the 1880s by Giovanni Pistucci. As far as we know, Sannino lacked a violin making family background and was not officially apprenticed to any Neapolitan workshop. Instead he began studying the violin at the Naples Conservatory. At some stage during the later 1890s he may have benefited from the advice of the makers Francesco Verzella (1840–1928) and Giuseppe Desiato (1826–1907), but it is generally assumed that he was essentially self-taught. Yet his early work bears a close resemblance to that of Giovanni Tedesco (1861–1947), one of Naples’s more obscure makers, who was some 18 years his senior. Some features, including a black pin or prick at the ears of the scrolls, found in the work of both makers, make it difficult to believe that they did not collaborate. 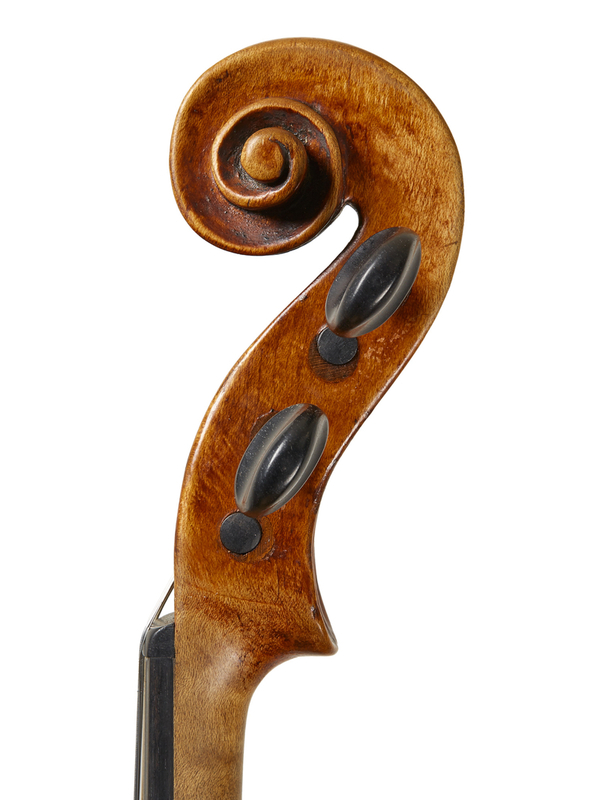 Though Tedesco’s own instruments are similar to those made by the young Sannino, they are generally rather plain when compared with those of Sannino, who from the start used flamboyant wood, covered with a much more interesting and vivid varnish. I suspect that many instruments by both makers, or perhaps those made in collaboration, originally bore Gagliano labels, but subsequently most lost them in favour of facsimile Sannino labels. The misattributions have led to assumptions that Tedesco worked for Sannino – something that appears much less likely than the reverse. At some point Sannino made the acquaintance of Fridolin Hamma (father of the better-known Walter Hamma), one of the well-heeled foreign dealers in search of fine old instruments across Italy. By around 1900 Sannino, apparently fluent in German, was helping Hamma on his violin hunts. 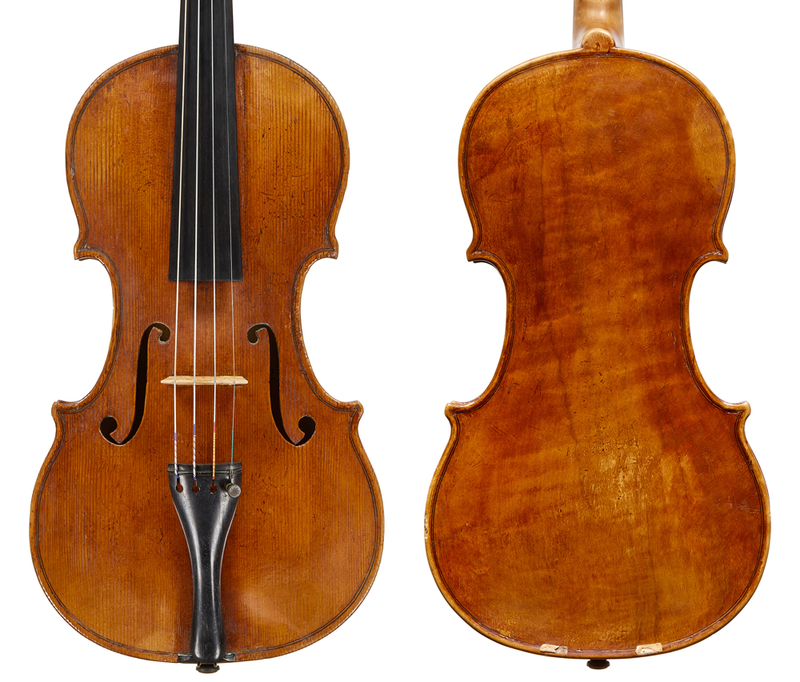 Though Hamma may not have been the one to spark Sannino’s initial interest in violin making, this connection may well have become essential in furthering his education through the introductions it offered to violin shops and clients in northern Europe. Sannino presumably looked up to his older local contemporaries, Postiglione and Pistucci, but he seems to have quickly realised that in order to compete seriously he had to develop his own style. By around 1910 Sannino’s work began to take on a new aspect – one closer to the 18th-century northern Italian masters than to the typically Neapolitan, simplified interpretations of the Nicolò Gagliano and Ventapane models (see this transitional example from the period). Like his close contemporaries from the north – Celeste Farotti, Gaetano Sgarabotto, and Carlo Carletti – who successfully worked in the styles of the older Italian makers from places other than their native towns, Sannino became the first southern Italian maker of his generation to look beyond local makers for inspiration. By around 1914 Sannino had apparently begun working in Rome. This was probably the first time a Neapolitan maker had to adapt to the influences of a different region. Whereas in Naples he faced competition from the prolific late Postiglione workshop (now in the hands of the young and industrious Alfredo Contino) as well as from the Pistucci and Armando Altavilla workshops, he should have found more professional opportunities in Rome, a larger city with more orchestras and fewer violin makers. Nonetheless, he probably often returned to his home town, continuing to use his ‘fece in Napoli’ labels, as well as producing dangerously convincing copies of the older Neapolitan makers, in particular Ventapane. In Rome Sannino’s new competitors, the young Simone Fernando Sacconi and Enrico Politi, were enthusiastically antiquing their instruments, appealing to those clients requiring cheap alternatives to fine old Italian masterpieces. Sacconi’s perfect copies in particular must have had an influence on Sannino’s development, especially the process of aging the varnish. Sannino, however, lacked Sacconi’s knack for detailed study of classical instruments and he shunned painstaking bench imitations in favor of highly liberal interpretations of the old masters, including Guadagnini, Stradivari, Guarneri and even Pressenda. He found success with this and, unlike Sacconi, became highly prolific. His best copies of Guadagnini are convincing enough to be found masquerading as the real thing! 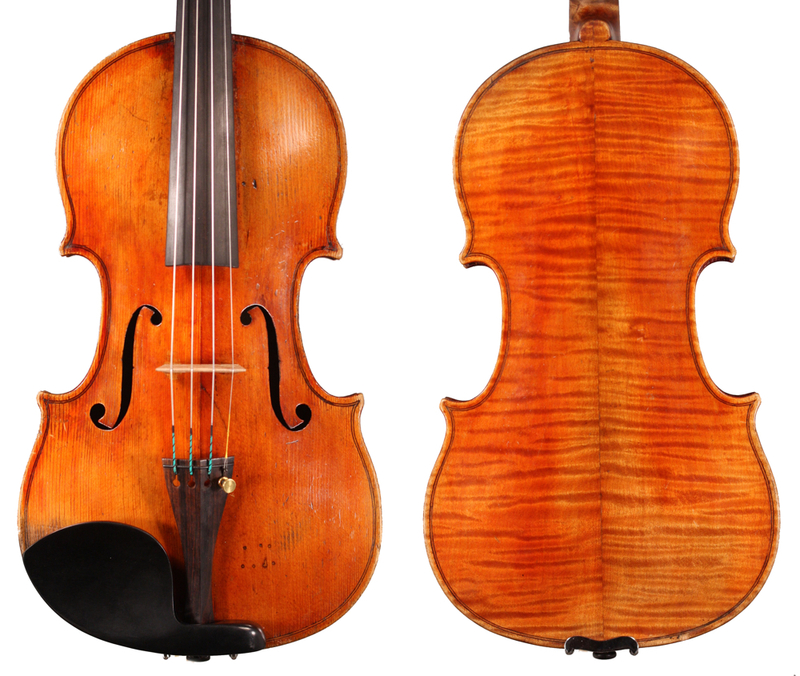 According to one original label in a violin dated 1924, Sannino worked in via Margutta, near the Spanish Steps – traditionally home to many craftsmen. By then he must have established himself more firmly in Rome, though his connections to Naples endured until as late as 1940, when he seems to have settled permanently in Rome. Interestingly, most of his instruments from the mid 1920s continue to bear the Naples label, making the actual place of their crafting quite difficult to ascertain, though for the most part it is assumed to have been Rome. Sannino was from the start capable of inspired and handsome work, but it is from the 1920s that he really stood out among his Italian contemporaries for his fluid, artistic, intense and highly distinctive output. His creativity is staggering and his unpredictable models both charm and surprise. The antiquing is normally tasteful and at times is so subtle that it is virtually indistinguishable from the natural patina of far older instruments. On some instruments, violins in particular, the antiquing goes slightly too far with marks, scratches and intense shading, resembling the antiqued varnishes of the Politis and Leandro Bisiach. Sannino used striking, often slab-cut maple and fine, normally even-grained spruce throughout his long career. While, perhaps due to haste, his wood-working is not that of an absolute virtuoso, his perfectly textured and translucent varnish seduces the eye. However, not all his instruments are equally inspired, allowing the works of lesser Neapolitan makes such as Tedesco, Desiato, and Sannino’s own son-in-law Vincenzo D’Aria (1912–c. 1946) to be ‘upgraded’ to Sannino. In his mature work Sannino introduced the hallmark round ‘locating’ pins, found several millimetres below the square and skilfully notched buttons, and above the purfling at the lower bouts; this positioning is similar to that of G.B. Guadagnini pins and is also found on some of Sannino’s Piedmontese contemporaries. 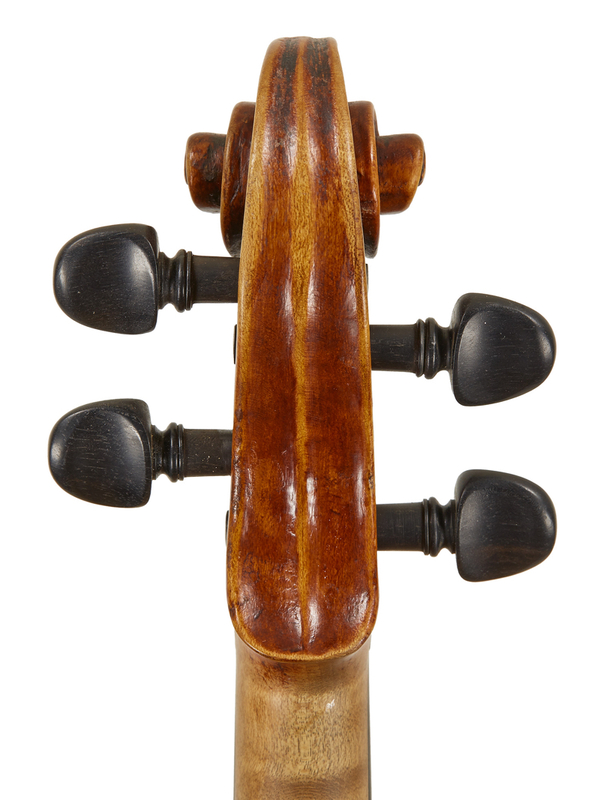 This feature is by no means the rule and a good number of instruments – perhaps those he did not consider as his ‘Piedmontese’ models – omit the back pins altogether, while in his copies of Amati school instruments the pins may touch the purfling. The purfling itself varies in width, precision and quality, though for the most part it is quite roughly made and tends to terminate abruptly within the corners. The corners are graceful and rather triangular, often with a flatness, but at times with a slight scooping visible at the center of the corner areas; the sound-holes are usually slightly tilted towards the center and have rather substantial, fluted lower wings. Sannino made instruments on at least seven different models, but his modelling varied tremendously within each model category (for example Guadagnini or Guarneri), underlining his intense creative spirit. The scrolls are perhaps the most recognisable feature in his ‘copies’, where Sannino remained true to his own convictions of proportion. They are generally quite Gagliano-like, no matter whose model he was otherwise invoking. Normally they are shallow in the turns and at the back of the pegboxes, which also project a distinctly ‘horizontal’ ending à la Gagliano. In a few of his numerous Guarneri models he attempted deeper carving with sharper lines, depicting the hasty working style of ‘del Gesù’. Some of Sannino’s scrolls show a black chamfer associated with Stradivari, Guarneri, Guadagnini and their followers. The instruments made in the 1940s continue to be of great interest, with their intense orange brown varnish colour and strong modeling. Sannino’s violin making career seems to have ended sometime during the 1950s. In the 1960s he was apparently still in the possession of some 20 of his own instruments. These instruments were bought from him at the end of the decade by his longstanding rival, Sacconi, on behalf of the Wurlitzer firm of New York. By then Sannino was apparently no longer on speaking terms with Sacconi, and therefore Sacconi asked his friends Giuseppe Lucci and Rodolfo Marchini to acquire them from Sannino for him. Sannino died shortly thereafter, in 1969, aged 90. Marchini recalls Sannino as having been a short, old man with bulging eyes and a feisty personality, who would recount stories about his violin making that impressed the young maker, including one about his unorthodox antiquing and sales techniques. According to Marchini, Sannino had tried to sell a newly made, straight violin to a conservatory, which dismissed it as ‘poor sounding’; he then resorted to antiquing this instrument by tying it to his leg and dragging it around his home for a day or two. 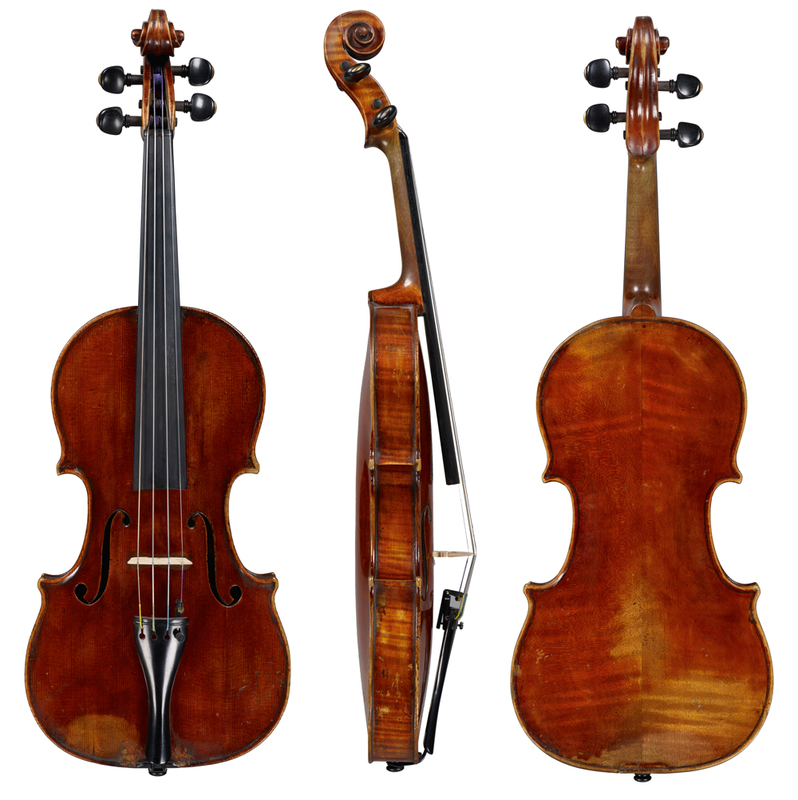 Having thus achieved the desired effect and after some minor touch-ups, he presented the same violin to the same client – this time as an old instrument. It was bought immediately on account of its excellent acoustic qualities! Marchini also informs us that Sannino had a daughter and a son, who was a fine concert violinist. Sannino worked at enormous speed and is reputed to have turned out 700–800 violins, 50 violas and 75–80 cellos. His labels are simple, ‘Vincenzo Sannino, fece in Napoli, 19__’, though in many cases they were made in Rome. On the left side they show a handwritten cross and below it, two or three symbols, one of which is consistently a flowery ‘V’. Many of his instruments that bore labels other than his, originally inserted by the maker, have later been relabeled with facsimile Sannino labels, making the dating process particularly challenging.